The word ‘manager‘ can be defined as a person who supervises his team mates work and make sure that they complete the tasks effectively and within the required time line. They are the ones responsible to focus on business objectives and see that the work has been accomplished as planned. In most of the organizations, every department or unit is assigned with a manager. They will be directly in charge of all the work to be done. However, there will be assistant managers who will be there under him or a supervisor who is directly instructed by the manager. The term ‘entrepreneur‘ is derived from French language which means ‘between-takers’ or ‘go-between’. An entrepreneur can be defined as a person who develops new enterprises by bringing together all the resources necessary for the productions to get started. They can also be called as businessman specifically the ones who have newly entered the business market. The entrepreneur will have a lot of responsibilities like finding new opportunities and gathering in all the resources needed for the process to go on and then make sure that everything is accomplished as it needed to be. There is a possibility that while working in a company a person might experience many things in their life which can change them and their career approach completely. Every person has his own career approach and regarding those career approach, people provide many different theories to get on with it. The most critical thing that an employee working in a company needs to understand is the key differences between entrepreneur and manager. Those key differences can encourage him to keep going in his life. 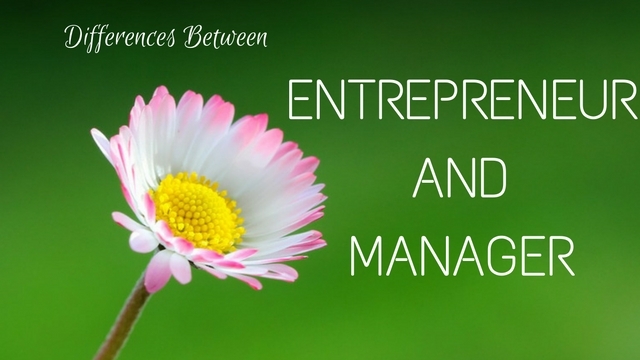 The concept of entrepreneurship and management is completely different from each other. The below-mentioned points explain the difference between management and entrepreneurship. A business entrepreneur is a person who tries to transform an idea into reality by making use of the opportunity and resources available to him. An entrepreneur also assembles the proper team and collects the required capital and materials so as to make the idea into a reality. This comes under the main functions of an entrepreneur. They are the individuals that start a business from scratch and the role of the entrepreneur is very vital. They have full power and authority of the business and also exercise the power as the head of the company on employees and workers who work for the company. They are more focused on the success and stability of their entrepreneur business and ensure that the company doesn’t incur any losses. Many entrepreneurs may or may not have much knowledge about the various aspects of the trade. They should be smart and confident to attract potential investors for the proper development of the company. Managers, on the other hand, are very much different from entrepreneurs on the basis of their work culture and style of task execution. Managers are more involved in the company when the company is relatively more stable and established. Hence, managers come into the later stages of the company development. Managers tend to be concerned more about the end products and works that aids in the growth of the company and play an important role in the smooth functioning of the business. Moreover, it is mandatory that a manager should know about the various aspects of the company including various processes such as product development, product designing, sales and promotion and also the leadership models and business aspects of the company and the product. Here we are providing you a comparison table which differentiates between entrepreneur and manager. What are the Differences Between Entrepreneur and Manager? An entrepreneur is responsible for all the activity of the company which he started to create a difference in his life, but where in which a manager just has to deliver his duties and responsibilities assigned to him in a certain department of work. Many entrepreneurs have the freedom to do take decisions and choices that can positively or negatively affect the growth of the company. On the other hand, a manager is a person who is hired by the entrepreneur to manage the business. They are professionally trained individuals who have the knowledge about the various business aspects. Therefore, it is important to understand that an individual entrepreneur holds the overall structure of the business as he is the idea behind the business, but a professional manager just follows the orders given by an entrepreneur. The work environment or the assigned job description of an entrepreneur and a manager can be completely different from each other. The entrepreneur is responsible for the starting and initialization of the business along with ensuring a proper launch for the business. In contrary, a manager is responsible for taking care of various things that are responsible for the success of the business and helps to run the business in a sustainable and responsive manner. Similarly, a manager takes care of all the ongoing activity of the business and makes sure each and each every department undertake suitable measures to run the business smoothly. It is not necessary that an entrepreneur must know all the entrepreneurial activities of the business. And sometimes there is even a possibility that an entrepreneur understands all the smaller portions of the business and their working departments. An entrepreneur must take all the responsibility for the ideas which can make the business go successful, where in which a manager needs to a specialize in his own work and his specialization need to favour the environment of the business. The entrepreneur is responsible for incorporating innovative and attractive ideas that are used to make the lives of the people simpler and thus they help to promote such ideas through their business ventures and trade activities. Managers on the other hand, tend to be more calculative and they form various plans and strategies so as to popularize the idea and motives of the company to the employees. This helps the employees to be inspired to work hard and provide more benefits to the company and the organization. An entrepreneur is allowed to make mistakes as his mistakes can educate him better in his upcoming decisions, but where in which a manager is concerned, he is not supposed to make any mistakes as he is one of the best in his field of work. An entrepreneur is allowed to make mistakes while seeking various innovative and creative ideas that can help with the development of the company. On the other hand, a manager should try hard to preserve the status and name of the company, so for this goal, it is necessary that the manager should not make unnecessary mistakes as this can be seen as a bad example by fellow colleagues and employees. A manager should strive hard to become an ideal model for employees so that they can follow his/her orders perfectly and efficiently. Therefore, an entrepreneur is allowed to make mistakes or prone to make mistakes and he even learns from their mistakes, but a manager needs to be perfect and not allowed to even think of making mistakes. It is not necessary that each entrepreneur who owns a successful leading business needs to be well educated in their work. There is a possibility that most of the successful entrepreneurs are school dropouts. But a manager cannot afford to risk his educational background for the sake of the job. A manager needs to be trained perfectly in his job profile. In most cases, an entrepreneur might not even know about the various aspects of the company such as the design section, innovations, and financial department and so on. On the other hand, it is mandatory for the manager to be well equipped and knowledgeable so as to manage the company in a stable manner. Therefore, as compared to a manager, an entrepreneur holds a poor level of educational background. As a nature of work is concerned an entrepreneur’s job is to take risks in their business so that the company can reach better heights of its own dimension. But a manager needs to act wisely during tough times. Unlike an entrepreneur, a manager needs to avoid taking risks in the field of his work. Many entrepreneurs like to take on risks as this will allow them to explore the different aspects of the industry that they are venturing into. Most entrepreneurs tend to take some risks as this will also help them to retrieve innovative and creative ideas required for the business. On the other hand, many managers are reluctant from taking risks and uncertainties as this can shake the balance and foundation of the working and functioning of the company. Most managers like to preserve the integrity of the organization by avoiding taking risks. Therefore, risk-taking nature is applicable higher in the working environment of an entrepreneur than a manager’s working profile. The most important factor that affects each and every single employee or employer of the business, including its entrepreneurs is its financial position. But the important part of that concern is that an entrepreneur holds all the rights to enjoy the complete financial freedom of the business. Entrepreneurs thrive on freedom which mainly includes freedom of capital, freedom of expressing ideas and suggestions, freedom to venture out in the industry and understand the changes in the trends and technologies and so on. In contrary, most managers tend to prefer stability and security over freedom while working under someone in a corporation. Most managers tend to like a secure job and better working conditions so as to maintain a satisfactory lifestyle. There is a possibility that an entrepreneur can enjoy complete financial freedom over the rest of the people concerned in the business. As it is quite obvious that all knows about the duties and responsibilities of the entrepreneur’s lines of work. But when it comes to managing the small business or a large entity, each and every person working in the company knows that an entrepreneur person holds the ownership of the company and none can take that ownership from the entrepreneur. An entrepreneur is the backbone of any company, be it a startup or a well-established corporation. The entrepreneur is responsible for establishing the company by transforming an idea into reality and also the driving force of the initialization and stability of the company. This is why an entrepreneur has the highest respected authority in an organization or company. A manager on the other hand, is someone who works for the entrepreneur and is responsible for only a part of the organization. Therefore, a manager is a person who handles the work and activities of the company departments, and an entrepreneur handles a complete business. As an entrepreneur is the sole owner of the business, a person can definitely figure out this simple factor about capital gains, that an entrepreneur is liable to enjoy all the capital gains of the business. But where in which a manager should can only be liable for the fixed salary which is not even a part of a capital gain received by their own services delivered for the overall growth of the company. One of the most targeted gains that an entrepreneur can achieve is a high profitability and capital gains through his organization, while a manger is more focused on having a high salary and a better pay scale along with better work conditions. An entrepreneur is driven by more profit while a manager is driven by more wages. Therefore, it is necessary to understand that even a manager makes the business run in a smooth manner; but they won’t receive any sort of capital gain for their service. When a commitment factor comes, a manager takes all the credit in this field of work. As it has been explained earlier in the capital gain that an entrepreneur is liable to take all the parts of the capital gain, but a manager needs to be allowed to receive his monthly salary. And because of these monthly salaries, a manager can switch his commitment towards the company constantly. Where in which an entrepreneur need to be committed towards their business even if they receive a capital gain or not. As mentioned before, an entrepreneur is the establisher and the backbone of the organization so naturally an entrepreneur will have the highest level of commitment among various employees of the company. Many entrepreneurs work day and night just to start their own company. On the other hand, the level of loyalty among managers is low compared to an entrepreneur they would prefer to get a stable job rather than toiling for a company. They usually change companies if they get a much better offer as they do not have any personal connections with the company, unlike an entrepreneur. Finally, the bottom line is that at the end of this discussion over the differences between entrepreneur and manager, a person might gather more information on the working nature of their job description. Therefore, interested people who are willing to learn more about these differences between entrepreneur and manager can read all the above-mentioned explanation about the topic.